I’ve been planning to do a post sharing some paper piecing hints and tips for awhile. Then suddenly it was Thursday evening and I had nothing to share for the paper piecing party! So I moved the schedule up. But we can totally pretend I planned it this way if it makes me sound more efficient. So here you have it, my quilty friends. As many hints and tips as I could think of. And a few completely random pics thrown in for fun (and possibly to entice you to further paper piecing – I happen to know of a good sale on!). And I’m not just saying that because I’m barely 5’4”. Short stitches are much needed for paper piecing. I know – you’re saying “why? Do you know how horrid they are to unpick? !” Why yes, yes I do and I’ll share a tip about that in a tick (see #7). But you need a short stitch length when paper piecing so that you can remove the paper from your block easily and without distorting the stitches. 2. Scaling. No scaling. Actual size. 100%. What printer setting?! Help! Oh one of the biggest questions in paper piecing! What printer setting do I need to make sure my pattern prints to the correct size? Side note: Some patterns have 1” scale boxes to help you measure. I know mine don’t. I wish they did. But currently there’s no way to add that in using EQ7 and I’m not sure how else to do it. Sorry. So back to scaling! The key thing is that you “Print to Actual Size”. Some printers give different wording but it all means the same thing. You don’t want it to automatically resize your PDF to print – you need it to be at the actual size, or no scaling. You’ll need to experiment a bit and see what works best for your set up. Stripes are awesome. Directional prints are awesome. Trying to match stripes and directional prints in paper piecing is not so awesome. Ok yes it’s fabulous when you pull it off, but you’re likely to pull your hair out in the process. Directional prints work brilliantly in small areas, but I wouldn’t advise using them for background prints or larger areas unless you’re pretty confident in your paper piecing abilities! 4. Pre-cut, rough cut, don’t cut, cut what?! Some people like to pre-cut their fabric to the template sizes before they start. I’m not that patient. I rough-cut mine. That is, I hold the fabric over the section I’m about to piece, and I roughly trim the piece of fabric to size. If there are angles involved, I recommend using a larger than necessary piece of fabric so that when that pesky angle occurs, you’ve got a bit of excess to cover the seam allowances. Trim your seam allowances back to 1/4” after every seam you sew. This is crucial in paper piecing. Otherwise you end up with a very messy block, with seam allowances being sewn into other seam allowances, and bulk and mess and just blerk. So trim as you go. Angles are not fun in paper piecing. You have to lay your fabric all weird and it’s counter-intuitive to how you think it should go. Especially if you’re spatially challenged like I am! But I have found a little tip that helps greatly when piecing angles. It’s too much to describe in a few words here but pop over and check out my tutorial with pretty pictures. 7. Line up, line up! Lining up seams. Oh that’s where the unpicker comes out to play. 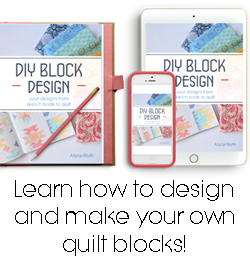 Making paper pieced blocks (or any quilting blocks really!) requires matched seams to make them look good. Or at least seams that are pretty close to lining up! Now I mentioned in #1 that you need a short stitch length when sewing. That’s a bloody nightmare to unpick if you muck up the lining up part. So here’s a tip. When you need to join sections together and you’re not sure if it’s going to line up perfectly… switch that stitch length to the longest one possible. Pin your sections together where you think they should line up, then sew that sucker with the long basting stitch. Check if your seams line up. If they do fab, rejoice and re-sew with the short stitch length again. If they don’t, well it’s still a date with your unpicker, but at least giant basting stitches are MUCH easier to unpick. 8. Backstitching prevents grey hair. Okay so that’s not true or I wouldn’t be keeping the hair colour companies in business. But trust me, it’s worth backstitching at the beginning and end of each seam to save some sewing stress! Okay it does add a teeny bit of bulk to your block, but my personal opinion is that it is worth it so that your pieced sections don’t start to come unravelled before you’ve had a chance to join them together. Yes you are using a shorter stitch length but you’re also manhandling those pieces quite a bit. Better safe than sorry and all that. I try to get away with finger pressing as much as I can. I have little kidlets so I can’t have the iron set up all the time and it drives me bonkers plugging it in to iron every itty bit then unplugging and setting it far away from curious little fingers. So I do finger press while I’m actually piecing each section then I head to the iron when I have all the sections done. My friend Alyce suggests using a tool called a finger presser (or there’s a thing called a seam roller), but I don’t have any personal experience with those so can’t really advise. If you do, tell me what you think! Oh.. and talking about ironing… if you have have to tape pattern pieces together because they printed over two pages… do NOT iron on the paper side, melt the tape, and ruin your iron. Not that I would have any experience with such a silly thing. Ironing is crucial however before trimming up your sections to join together. Okay no real tips here on trimming or removing paper. I just didn’t want you to think I’d forgotten to mention some amazing revolutionary tip on these things. If I knew one, I’d tell you. Honest. I don’t. Trimming is boring. So is removing paper. I watch tv/a movie when I get to these steps (ok I listen to tv/a movie when it’s trimming time, because you know, I don’t want to slice my fingers because rotary cutters are sharp). Oh wait there’s a tip – trimming on paper dulls rotary blades quickly. I use an old crappy cutting mat for trimming, but I don’t change my rotary blade as often as I should. Bad quilter. So that’s the top ten I can think of. I’m sure there are more that I’ll think of as soon as I hit “publish”. So if you think of a fab tip that you feel your fellow paper piecers ought to know, please share! Or just link up your awesome foundation pieced pattern for us to admire! 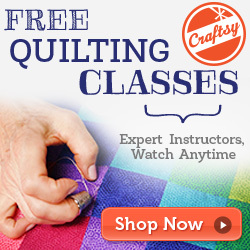 * I’ll pick one each week to win their choice of a free pattern from my Craftsy shop. Keep on paper piecing ;) Last week’s winner was Michelle! I have been using a seam roller ever since it was recommended in a class I took with RaNae Merrill. It's wooden and I used to use it to roll seams when hanging wallpaper. It is my new favorite tool. No kidding, this thing works! I also use it sometimes for pressing when I'm not paper piecing. Like to press seams open (when necessary) without burning your fingers or to get seams to lie in the direction I want. I still use the iron, but not every step of the way. RaNae recommended that you get a roller that is a little fatter in the middle of the roller part than on the edges and mine happens to be that way. Don't know why I let it sit unused in the basement for so many years! Yup I use a Clover finger presser and love it ... do you have the steam on or off when you iron? I was told steam distorts the fabric? Thanks for all the hints. Lining up the seams has been my biggest frustration so the idea to use larger stitches will definitely be taken on board! Love the way that you entice us all with those beautiful patterns!! Great tips, I'm soaking it all up at the moment - I haven't found the time to try paper piecing yet. Every week I hope to have something to link up with but not so far, maybe when Pepper-Mae passes through this 'all my teeth want to come at once' phase. I have a question though - I have read that you shouldn't use normal printer paper as your foundation. What do you use for your paper foundation? I use normal printer paper as it's handy! I haven't really had any problems with it. On the rare occasion I might find if I've pieced with white thread that it goes a little grey from the printer ink but no hassles otherwise. I have just ordered some of Carol Doak's Foundation paper to test out - but it does work out a lot more expensive than everyday printer paper! I have a little wooden seam roller that works really well so I only use the iron at the end of each section. I have tried Golden Threads(?) foundation paper which is really good but a bore to trace all the patterns on to it first although it is easier to remove at the end. The other little gadget I have is a special ruler with a quarter inch lip to it which is great for trimming - I can't remember what it is called but you can get an eighth of an inch one too. Only you could make tips and hints on paper piecing fun :) !!!!! I've been really enjoying your And Sew On BOM, I've found that I love paper piecing and it's all down to you, so thanks! The tips above are great, especially the one about using a big basting stitch (something I'd thought myself but was too lazy to do!). As you know I'm a novice, but I do have a couple of tips if you're interested? Firstly I use a mini iron, I keep it next to my machine and it's perfect for ironing after each seam, though I have to use the main iron for a finished section to squash it into submission. secondly, instead of using normal sellotape (scotch tape?) to join the parts of a pattern and risk melting it, use washi tape. It's also a breeze to sew through as it is basically paper itself. this cracked me up (angles are poo)! great tips! Great tips and the angles tutorial was great (I've got that spacial thing going on too). I use a seam roller I got from the paint store ~ it's really used for wall papering but works great on pressing! Awesome tips Kristy! #7 has been my lifesaver, and yet the number if times i tell myself that i don't need to baste stitch it first thinking that the magic is going to happen and the seams will align! As for pinning, i find it easier to use a couple of stitches where critical seams meet up then using pins, i just can't use pins. I can pin the crap out of something and it still shifts! Thanks for the tips. I'm always unsure on where to start stitching....either on the line, before the line or to back stitch on the seam???? I tend to sew on the line and only within the section (and backstitch within the section) but others sew from the seam allowance. Might be personal preference? I think I shall have to experiment and see! Thank you, thank you, thank you for #6, which I tried a moment ago and was amazing. I'll also be trying out #7 when I need it. I'm so glad it helps!! These are really useful, thanks! Great tips for paper piecing. I took a class on foundation piecing from George and Virginia Siciliano, and they taught me to always to 2-3 stitches BEFORE the "start" point and 2-3 stitches AFTER the "end" point. This way, the stitching doesn't come apart and backstitching doesn't get in the way of the next piece. It's work wonders for me. That's really interesting! I personally don't tend to stitch into the next section as I find it makes a bit more awkward to work around. But I shall have to experiment further! Great tips, Kristy! I will be trying #7 tonight when I try putting my crow blocks together. I use a Clover mini-iron when I'm pressing the teeny little seams after I add each piece. It works great and it's small enough that I don't burn my fingers! These are some great tips! I am just finishing my first paper pieced quilt. Definitely enjoyed it. I have one rotary cutter that I use just for paper piecing. That way my other rotary cutter blade stays sharp. I tend to press down harder with the paper piece blocks, than I do with regular blocks. Thanks so very much for this! I love the results from paper piecing but have been frustrated by the amount of fabric required. Your suggestions will be very helpful!